Hardcover (9 3/4 x 10 3/4), Island Paradise Publishing, 2000, First Edition 4th Printing (stated). Pages not numbered. Colorfully illustrated throughout. Map endpapers. Includes Glossary. Clean with mild edge and corner wear, tight straight spine, mild scratch and dent. Label on cover is an Award of Excellence from Ka Palapala Po'okela, the Hawaii Book Publishers Association. 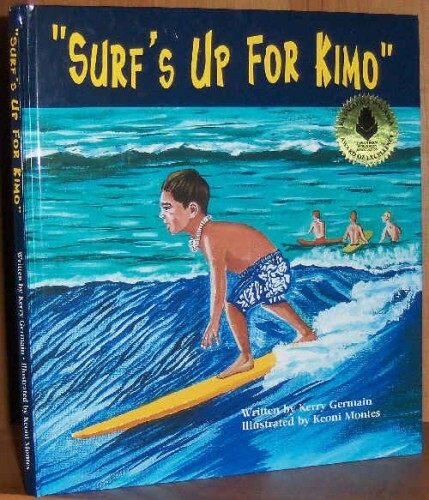 Attractively illustrated, the story presents family life in a beach community on the North Shore--focusing on Kimo who wants to be a great surfer like his older brothers.